M. Louise Stanley is an artist for our times. When life is uncertain, her sense of humor, deeply rooted in our history and the human predicament, offers us ground to stand on. Her Main Gallery exhibition, titled Risking Ridicule (does it really matter? ), will be curated by Sanchez Artistic Director Jerry Barrish. Many of Stanley’s large acrylic paintings are based on classical themes drawn from her extensive travel and study in the great art centers of France, Italy, and Greece, with titles such as Jupiter and Io and Wounding of Chiron. These are grand, archetypal tales, but Stanley offers us these classics with a touch of sixties R. Crumb comics perspective, and it turns out to be just what we need to see. 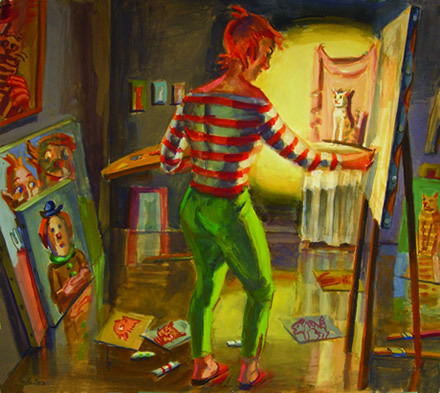 Another theme is the plight of artists, with her alter ego character offering us a real-life glimpse of the working artist’s inner and outer life. Stanley’s paintings are realistic and narrative in detail, yet softened with light and a sensuous color palette to delight us as well as help us question our fears. A big part of Stanley’s research for her work comes through the European art tours she offers to students. She has developed a style of journaling that captures all the impressions she needs to store from her travels, as well as becoming artwork in its own right. Several of her journals and journal images will be included in Risking Ridicule (does it really matter?). 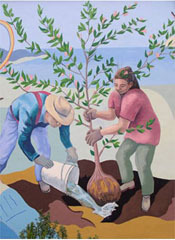 Stanley will give an Artist’s Talk on Sunday, February 8, at 2 p.m. See more of her work at http://lulu.artist-at-large.com.